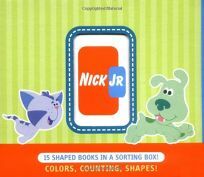 Youngest Nick Jr. fans can learn colors, numbers and shapes with Colors, Counting, Shapes! : 15 Shaped Books in a Sorting Box! From the ""box,"" ""picture frame,"" and ""quilt"" on the spreads of Square Shapes, to the ""1 apple,"" ""2 wheels,"" and ""3 cookies"" in Circle Counting, toddlers will soon master their basics with these nifty little shaped board books, all of which toss neatly into an opening in a sturdy storage box decorated with Nick Jr. characters. .